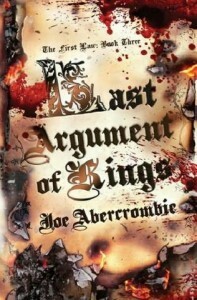 In much the same way that the second book in the trilogy kept all the good points of the first book and added to them to give a more complicated and more satisfying book, so the last book in the First Law trilogy further builds upon the strong foundations provided by the first two instalments to produce one of the most compelling Epic Fantasy novels of recent years. The plot begins with many characters returning home, and few of them finding the experience entirely pleasant. Logen is back in the North again and finally reunited with his old band of warriors who are allied with the Union armies as they prepare to strike back against Bethod’s invasion. However he soon finds old tensions beginning to resurface when he returns to the lands where he is infamous as one of the North’s legendary warriors and legendary villains. Back in Adua, the heart of the Union, Jezal finds himself reluctantly manipulated into being a figurehead for Bayaz’s attempt to rally the Union forces against the imminent Gurkish invasion. He also finds that his reunion with Ardee, the woman he believes himself to be in love with, doesn’t go as smoothly as planned. Ferro is another tool of Bayaz’s, as he continues to mould her into a deadly weapon that Bayaz believes could allow him to defeat Khalul’s sorcerers. The scope of Bayaz’s schemes becomes increasingly clear as he is revealed to be behind many of the events in previous books in the series and it also becomes clear the extent of his ruthless determination to defeat Khalul’s army, whatever the cost. Meanwhile, Inquisitor Glotka finds himself caught between a rock and a hard place after the head of the Inquisition tasks him to investigate the shadowy group who helped him survive in Dagoska. There is a lot of plot to get through in what is, by Epic Fantasy standards, only an average-sized book. As well as the main plotlines of the Union’s battle against the Northmen and Bayaz’s scheming against Khalul there are numerous subplots, including the political manoeuvring following the death of the Union’s elderly King, a peasant rebellion that is not what it first appears to be and a figure from Bayaz’s past out for revenge with some extremely dangerous allies. All the plots manage to be compelling and while some of the plot developments could be predicted from previous books there are also a number of surprising twists. There is plenty of action as well, the two big set-pieces are a battle in the North as Logen and his Union allies desperately try to hold a narrow valley against Bethod’s army (a battle reminiscent, probably intentionally, of Helm’s Deep in “Lord of the Rings”) and the brutal battle of Adua as the Gurkish forces attack the city but run into surprising resistance as Bayaz’s plans come to fruition. As well as the big battles there are a number of other great scenes, including Logen’s duel with Bayaz’s supernaturally strong champion and a confrontation inside the Maker’s tower between Bayaz and an old enemy of his. The plot comes to a satisfying conclusion that wraps up the major plotlines while still leaving some things unresolved. The ending is surprisingly cynical and although it is superficially a victory most of the characters end up unhappy even if they have achieved what they thought they wanted. Although readers looking for a traditional happy ending may be disappointed, it does seem an appropriate way to finish a series which always had a fairly cynical approach to conventions of the Epic Fantasy genre. As in the previous novels the characterisation is one of the strongest features of the book. Some characters get more character development than others, but there are some very interesting and occasionally surprising developments. The most notable development is a deeper exploration of Logen’s character as it becomes increasingly clear that for all his superficial likeability and surprising thoughtfulness he is not the hero he may first have appeared to be and the negative opinion of most of the Northmen is shown to be increasingly justified, particularly after a monstrous rampage during one of the battles. Another thing that continues from the previous books is that there is plenty of memorable, quotable dialogue – particularly from Glotka and Logen. In summary, this is one of the more entertaining fantasy novels of recent and a satisfying conclusion to the trilogy. It may not have done anything particularly revolutionary but a compelling and intelligent plot combined with some great characters make this a very good example of the Epic Fantasy genre.